Magnolax is a drinkable emulsion that acts as a laxative, making bowel movements effortless. Suitable for: Adults, the elderly, hypertension and diabetes patients, hemorrhoid and fissure sufferers, pregnant women and women post partum. Safe for use in children age two and up. 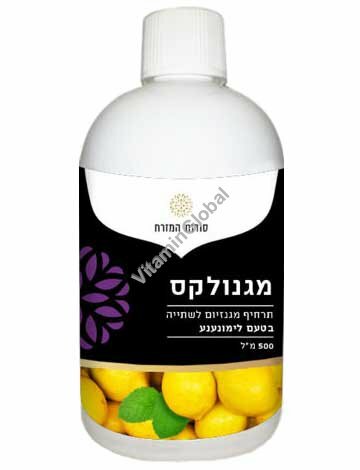 Ingredients: water, magnesium hydroxide, glycerin, caramel color, flavor of lemon and mint, xanthan gum, carboxymethyl cellulose, sucralose. Instructions for use: Shake before use, be sure to close the bottle after use. Children 9 and older: 0.5 teaspoon (2.5 ml) at bedtime. Adults: 0.5-1 tablespoons (15 ml) at bedtime. Important: Magnolax is forbidden for patients suffering from renal failure. Store in a cool place, avoid freezing. Pregnant women, breastfeeding women, people taking medication - consult a doctor.